One of the best parts about staying at Tropical Breeze Resort is how close you are to the beach. Not every hotel can boast five beach access points within walking distance. It’s just one of the amenities of booking your vacation with us–the beach is two blocks from your front door. Walk, bike or scoot to the shore within minutes. Beach towels are provided with your rental and don’t forget to stop by at The Adventure Tiki right by the office for beach equipment rentals. Sunset Point at Siesta Public Beach Access Point #2 is the place to be when the sun sets on Siesta Key. You’ll be in good company as many gather on this western point for the best view of the sunset on the island. A beautiful, rocky outcropping, Sunset Point makes for amazing photos but no swimming is allowed. Fishing with a license at Sunset Point is permitted. Parking is available at the access point but goes quickly. An evening bike ride is a fun and convenient alternative to driving when you’re this close to the beach. Guests at Tropical Breeze Resort and Siesta Key Luxury Rental Properties receive two free hours of bike rentals for each day of their stay. Heading east on Beach Road, you’ll come to Public Beach Access Point #3, Public Beach Access Point #3b, and Public Beach Access Point #4. Any of these are great for swimming and lifeguards are on duty from 10:00 a.m. – 4:45 p.m., seven days a week from September 6 through Memorial Day. Plan ahead by noting that Beach Access Points 3 and 3b do not have parking available, while Beach Access Point 4 does offer parking from 6:00 a.m. – midnight. Fishing is a great way to kill the time. Licensed fishing is permitted at all three points. Siesta Beach Access Point #5 is at the intersection of Beach Road and Ocean Boulevard, still within minutes of your rental at Tropical Breeze Resort and moments from Siesta Key Village shops, restaurants and nightlife. Make a day of it by planning your beach excursion to this public beach access point. Access Point 5 does offer parking while available from 6:00 a.m. – midnight, lifeguards on duty, and fishing opportunities. 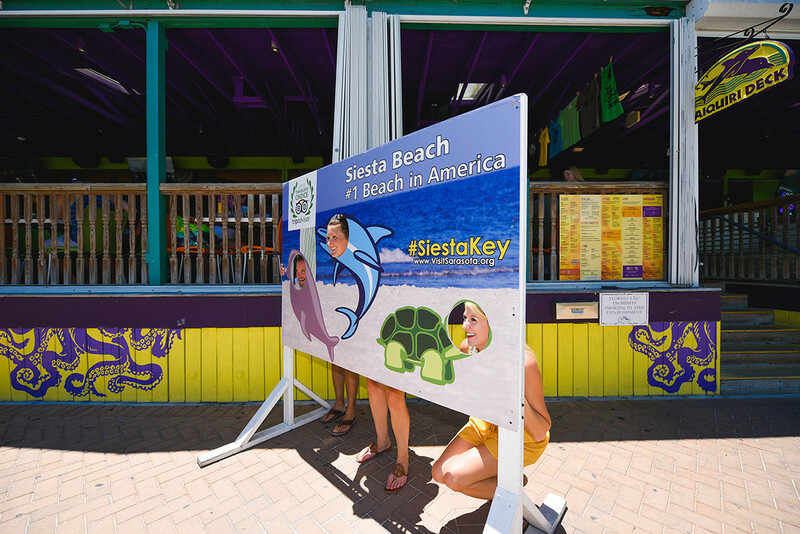 Siesta Beach has been called the best by both Dr. Beach and the Travel Channel. White quartz sand and shallow water near the shore make for an ideal trip to the ocean. Alcoholic beverages are permitted on Siesta Beach, though no glass bottles are allowed. Siesta Key Beaches do not allow dogs. You will find tennis and volleyball courts, a shaded playground and picnic area for families, convenient concession stands, and beach wheelchairs available along Siesta Beach.